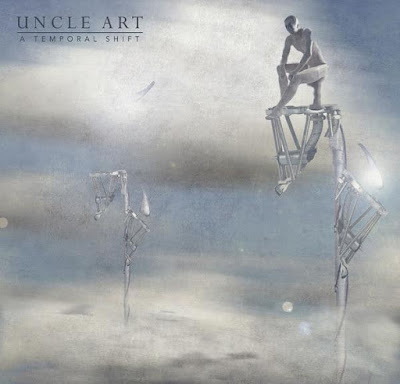 Album cover for "A Temporal Shift"
Towards the end of last month, Dave Lowe aka Uncle Art, along with his daughter Holly Jazz Lowe, released a new album called "A Temporal Shift". This album is the result of almost two years hard work and wouldn't have been possible if it didn't receive funding via Kickstarter in early 2015. I'm still waiting for the physical CD version to be delivered but I've had many listens to the digital version of the album and think I'm in a position to review it. So the album doesn't have that many tracks on it, 10 in total, but what will become apparent as you listen to this album is that it's very much a case of quality over quantity. The album is currently available in MP3 and FLAC formats but CD and vinyl versions are to come later down the track. Basically, all the music on this album are remakes and remixes of Dave Lowe's retro PC game soundtracks of the 80s and 90s so the album will mainly appeal to those that have played games like Frontier: Elite II, Carrier Command and Starglider (as well as a few others). I've actually only really heard two tracks on this album before and they're both from Frontier: Elite II yet even though I don't have any prior sentimental attachment to the other tracks on this album, I still get pangs of nostalgia when listening to them regardless since they emulate styles of music popular in the 70s and 80s. ...even though I don't have any prior sentimental attachment to the other tracks on this album, I still get pangs of nostalgia when listening to them regardless since they emulate styles of music popular in the 70s and 80s. It's hard to pick a particular track that's my favourite as there's so much good stuff on this album; the two live orchestral versions of "Frontier" and "Enemy in View" (the two tracks from Frontier: Elite II) are obviously magnificent, and while I've heard these tracks performed by a faux synth orchestra, nothing beats the real thing. "Frontier" sounds exactly how I expected it to and sounds like a mix of John Williams's "Star Wars" and Alexander Courage's "Star Trek" (the Original Series). "Enemy in View" is just as good as the main theme and again seems to emulate "Star Trek" in parts but sounds more like the work of Michael Giacchino mixed with a hint of Holst. The remaining tracks on the album aren't orchestral and consist of a mixture of synth and live instruments. In fact, my only criticism with the album is that sometimes I think the synth is overdone and they would've benefited from using live instruments (especially brass). But that's really my only criticism since there's just such a diverse range of styles at play here that you're bound to find something that tickles your fancy. "Games", the track immediately following the first track on the album " Frontier", starts off with some beautiful piano accompanying radio chatter from the game Elite: Dangerous and then turns into an energetic 80s/90s rock track which sounds like a mix of INXS and Queen. The third track on the album, "Brightest Star" is based off a track that was actually released on cassette tape with the game Starglider 2 which probably explains why the remake of this track sounds like it belongs back in the 80s, but in a good way. The track actually reminds me of the band Level 42 (which reached its peak in the late 80s) thanks to a generous serving of slap bass, synth and reggae. The fourth track is based off the theme to a very well respected, post-apocalyptic, cyberpunk point 'n' click adventure known as Beneath a Steel Sky. "Beneath a Steel Sky" is probably the most downbeat track on the album but with its moody, soulful vocals and an epic saxophone solo, it somehow reminds me of Dire Straits or bands with a similar style back in the 80s. While the remaining tracks aren't as strong as the offerings I've already mentioned on the album, they still deserve a listen; "Electric Flag" (which is based off the theme to Invisible Shrinking Sphere) sounds a bit like the band Madness scoring the music for a 70s cop show, "The Longest Night" (which is based off the theme to Midwinter 2) has got a very cool, Santana vibe to it, "F1 Carrerra" (based off Microprose Formula One Grand Prix) sounds like a fast-paced, Mariachi infused take on Del Shannon's "Runaway" (and yes, I know the riff is based off Fleetwood Mac's "The Chain" but that's because BBC F1 coverage traditionally had this track play), and for the last track on the album, you get treated to "StarBurner", a mixture of the Starglider and Afterburner themes with a very James Bond vibe to it. "A Temporal Shift" is an album that really lives up to its name: I feel like I'm in a time warp, like I'm reliving the 80s and 90s by just listening to the tracks on this album. If you played games like Carrier Command, Frontier: Elite II, Starglider 2 and Beneath a Steel Sky, purchasing this album is a no-brainer. But even for people like me who never played most of these games (except for Frontier: Elite II and Beneath a Steel Sky) every track is a trip down memory lane, to the simpler times of my youth. With such a diverse range in styles such as classical, prog-rock, ska, funk, reggae and rock 'n' roll, there's something here for everyone. If you're interested in purchasing the album, it's currently available in digital format for £15.00. It is coming to CD and vinyl soon.